Last week’s news of a process, or lack thereof, to deal with the displaced Confederate monuments reminds me that for every war there are stereotypes but beyond every stereotype there are stories of real people with many battles to fight. That includes John Bell Hood, whose saga would even involve General P.G.T. Beauregard. Like many other out of work Confederate officers, Hood came to New Orleans after the war hoping to find a future. The recent past had been tough. 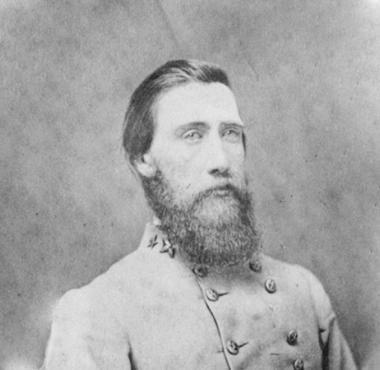 Early in the war the Kentucky native had been regarded as one of the Confederacy’s best commanders, but defeats under his command at Atlanta and Franklin (near Nashville) had sullied his reputation. The war had taken a physical and a mental toll. He lost a leg and the use of one arm. Other parts of him worked just fine though. In 1868 he met and (to her father’s chagrin) married Anna Marie Hennen, a New Orleans woman of some wealth and special standing who was smitten to be marrying a general. Over the next decade the couple had 11 children, including three sets of twins. They settled in a fine house that still stands, on the corner of Camp and 3rd streets in the Garden District. There wasn’t much need for soldiering in post-war New Orleans; indeed native general P.G.T. Beauregard had gotten work heading up the local lottery. Hood became involved in a cotton brokerage and insurance business, had some early success but faced his own financial Appomattox in the winter of 1879 after a yellow fever epidemic forced the Cotton Exchange to close and depleted every insurance company in town. That summer there would be a smaller yellow fever outbreak that would take only eight people citywide. Unfortunately, three of the victims were in the Hood household including his wife, oldest child and then, on August 30, the general himself. Originally, the parents and child were buried in Lafayette Cemetery near the present site of Commander’s Palace. Later they were interred forever in the Hennen family tomb in Metairie Cemetery. Left behind were certain legacies including the ten orphaned Hood children. What to do with them became a national cause headed up by General Beauregard. Failing to find a single family willing to take them all, the children were gradually dispersed to different homes across the country. Another legacy was the general's name. At his prime during the war he headed the Confederacy’s Texas Brigade. In what has to be perceived as an act of national benevolence, a U.S. Army base in Texas was named after the general who once fought against the American flag. Like the namesake general himself, Fort Hood, scene of a 2009 mass shooting incident, would become a symbol of triumph and tragedy. SEPTEMBER 2005. New Orleans was facing its worst crisis since the yellow fever outbreaks. Robert Hicks, an author specializing in novels based on the Civil War was on a book tour to promote “Widow of the South,” a novel based on the battle of Franklin, Tennessee, where Hood faced a devastating defeat. By the time Hicks’ tour reached Katrina-ravaged New Orleans he saw a city in no mood for book signings. Instead, the author became transfixed with the city’s plight and decided to do what authors do best, write another book. Drawing from his knowledge of John Bell Hood, Hicks saw Katrina-like parallels of man vs. disaster. In Hicks’ novel Hood spent his last days trying to embellish his war record, in effect facing his own recovery. The book was called “A Separate Country,” partially, Hicks explained, because the New Orleans experience was a separate country for Hood. Hicks’ work was certainly a novelty, a “Katrina-inspired” book set during Reconstruction and based on a Confederate General. Then as now New Orleans is a city of charm and challenges, one with possible battle lines behind every levee.